Treat yourself to an entirely new way of cooking with Falk Culinair bimetal technology. 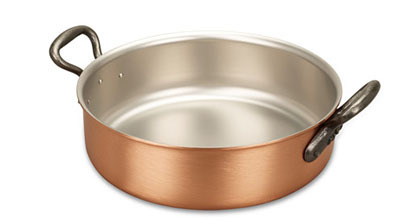 Our "Try me" piece, the 18cm Saucier, is a great introduction to our fantastic range of solid copper cookware, and at only only £85 represents tremendous value for money. We truly believe that our cookware is the finest product available, and we think our 50% discount for new customers will help convince you as well. We love being able to offer pieces that possess such ingenious versatility. Our 24cm rondeau functions as an ideal braising vessel, and a uniquely effective slow cooker. It poaches and braises as well as providing that wide base that makes browning recipe components simple. With all these great uses and many more besides, you'd have to agree that this pot is superb value for money. Falk Culinair, we give you more. Falk Culinair's bimetal technology meets the needs of the 21st century while preserving the quality and timeless beauty of solid copper. Excellent size for roasting chickens, a small fry up, perfect size for 3-4 portion size as a main or a side. Will be enjoying this pan for years to come. 440 customers found this review helpful. Did you? Yes, I did! My second Falk Rondeaux, the 24cm meets the same high standard of construction, finish amd usability. The even spread of heat across the base is clear to see and the lower gas level needed on the hob encourages flavour retention. Hob to oven to table it is such a useable piece, covering the fullest range of temperatures and cooking styles with ease. 596 customers found this review helpful. Did you? Yes, I did! Rollover the image to zoom, or click to view this in high definition. If you are not totally satisfied when you receive your Falk Copper Cookware, you can simply return this to us for a full, no-questions-asked refund. In addition, all our products carry a lifetime warranty against any manufacturing defects. Receive the latest product news, offers and recipes direct to your inbox. © Falk Culinair UK 2010-2019. All rights reserved.